The anticipation is always higher than what the Oscars can deliver. I think Jon Stewart's opening line says it all: "No Country for Old Men, Let There Be Blood, Sweeney Todd, The Demon Barber? Does Hollywood need a hug? Thank god for teenage pregnancy." Maybe Hollywood does and maybe it doesn't. But the Oscars might need an audience, and the 80th edition had one of the lowest turnouts ever. Word is out that at least in the USA viewing was low because not enough Americans were nominated! Looking at the actor categories its pretty awesome to note that the winners are all from outside the JUESSAY. Both Tilda and Marion gave kudos to the men that make them rock: Olivier Dahan and George Clooney and then Javier Bardem thanked his mother and Daniel Day Lewis his girfriend. Joel Cohen revealed that what they do in No Country for Old Men is no different from their first film, Henry Kissinger on the Move, shot in Super 8. I hope that my Super 8 film on The Underwater Real Estate Twins and a human ashtray will catapult me to Oscar glory. It is really the same, yes it is. Time will tell. The Oscars could be significantly shortened by taking out the music numbers and stop mentioning "Jack" all the time. As a role model it is unfortunate that he is the leading veteran in the house. Could we say his appearance with Boris Karloff in The Terror (1963) is actually no different from his appearance at the Oscars? Indeed, Hollywood seems to really be a country for old men, and the men who make the women rock. And the men who decided to put them all in one arm dresses this year. 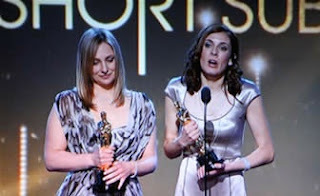 One refreshing addition to this Oscars was the thank you speech by Cynthia Wade, winner of the best short. She directed Freeheld, the true story of the terminally ill Lieutenant Laurel Hester who wanted to leave her pension benefits to her life partner - Stacie. (PS 35,000 viewers from Sweden watched the ceremony on TV9- 45,000 average in the Red Carpet - acknowledged during the pre-event for sending email- and up from 20,000 viewers last year. Population of Sweden, 9 million.